Assess the performance of a number of new satellite systems using reference-quality data and data assimilation (Task 4.1). Develop infrastructure for near-real-time acquisition of reference-quality data (Task 4.2). Develop software systems to enable monitoring of reference-quality data streams using global data assimilation systems (Task 4.3). 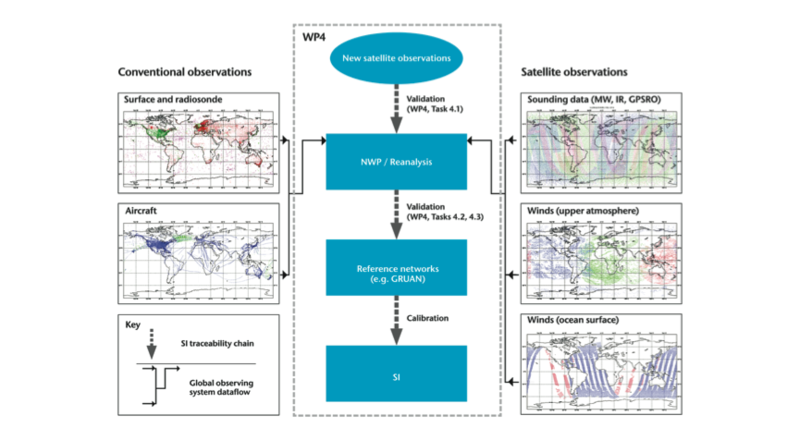 Develop a more general approach to use of reference-quality data in data assimilation, including for oceanic and terrestrial Essential Climate Variables (ECVs) (Task 4.4). Figure: Conceptual illustration of the potential route by which data assimilation can be used together with reference-quality measurements for assessments of satellite-data quality.